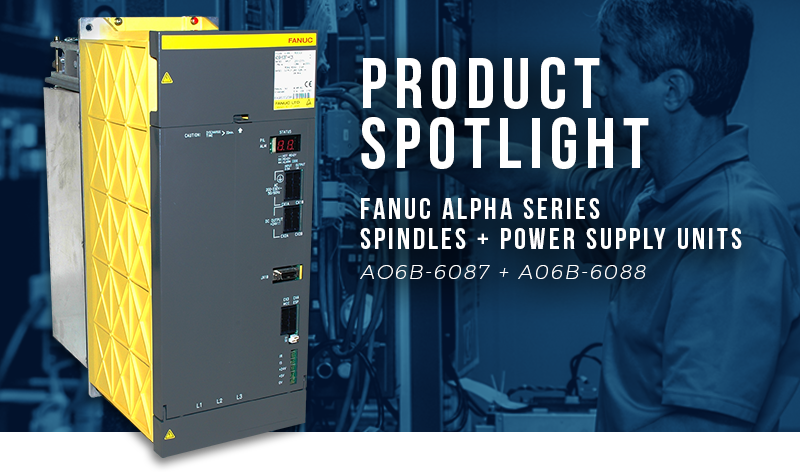 This month, we are highlighting the Fanuc Alpha series Spindles and Power Supply units. We had previously described some of the features and alarms with the Alpha series servos and wanted to continue on with the Alpha series drives. The A06B-6087 and A06B-6088 units are the modular style power supply and spindle units respectively. They share a common bus with each other as well as with the corresponding servo units. Incoming power is supplied to the power supply and this unit outputs all needed voltage to the remaining units in the chain. A benefit of the modular design of these units allows for the seamless installation and removal of units in the chain. It is also possible to add an additional axis without having to physically remove a drive from the chain. Often times, issues with the power supply unit will manifest in the spindle drive and vice versa. For instance, a common pair of alarms to see on these units would be an alarm 01 on the power supply with alarm 30 on the spindle. These alarms point to overloads or overcurrents that can be due to issues with the spindle drive or motor or an issue with power regeneration in the power supply unit. The power supply for the Alpha series has 4 different variants. The standard is a 200V/230V supply and has a self-contained power regeneration capability during motor deceleration. The second variant of the power supply is nearly identical to the first without the added regenerative capability. When using the PSMR variation of the power supply, a regenerative discharge unit must be used as well, or else the user risks damage to the circuitry during motor deceleration. The last two variants of the power supply are high voltage modules, with output ratings at 400V/460V. The PSM-HV requires a capacitor module (PSMC-HV) to aid in smoothing the DC voltage. The spindle drive has 3 variations: a standard 200V, a 400V offering and a unit designed specifically for the Alpha-C series of spindle motors. These units are versatile, with outputs ranging over a wide array. The various spindle drives start at 2.2kW and can go up to 45kW in output power. This allows for a significant range of applications due to the various sizes possible. The power supplies span a range of 5kVA up to 79kVA. These power supplies can run two spindles, assuming the output capacity is sized accordingly. With the compact and efficient design from one of the most trusted brands in the CNC world, Fanuc's Alpha series is a highly reliable line of drives and motors that are still in heavy use today. Here at Precision Zone, we specialize in the repair and testing of Alpha series power supplies, spindles and servo drives and motors. For more information on repair or troubleshooting, visit us online today!